I’m going to go out on a limb here and say that angry beavers are probably my spirit animals. (Get it? Limb. You know, trees?) Sorry about that. Anyhoo, those pointy weasel things do indeed lead a life not too different from mine. Norbert and Daggett are supposed to be responsible and basically adult-like, but they spend most of their time playing with toys, eating junk food, and staying up all night watching TV. Yep, same here. We can’t help it. We’re all just big kids. Oh, and in case you’re curious, I’m the Daggett Doofus Beaver of my house. I’m a big, klutzy, daddy longlegs hating baby who breaks things. My Norby Worby just so happens to be my little sister. She acts much older than I do and she’s crazy about hair and music. Also, she may have on occasion tricked me into doing things for her. All we need is a bunk bed and some Lickety-Splits and we’re the beaver dream team. There’s just one thing we’re missing: jalapeños. The beavers’ food of choice. And what is the best way to wolf down those little peppers? 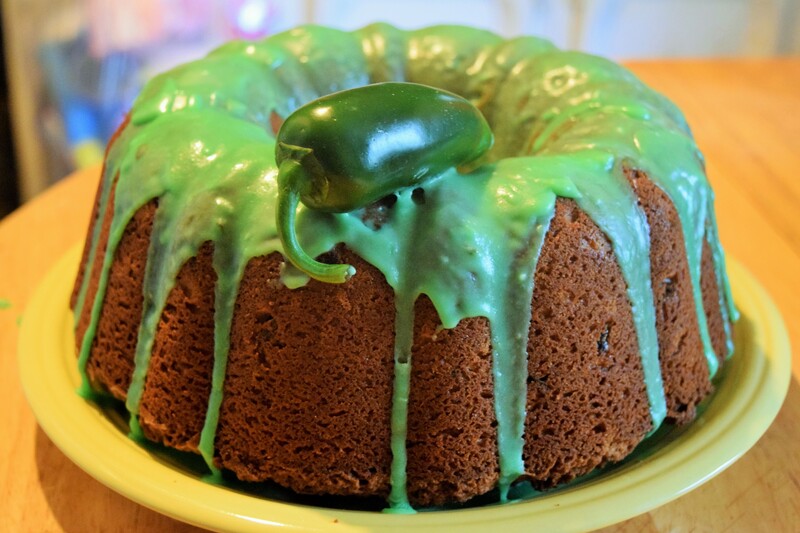 By baking a jalapeño Bundt cake! 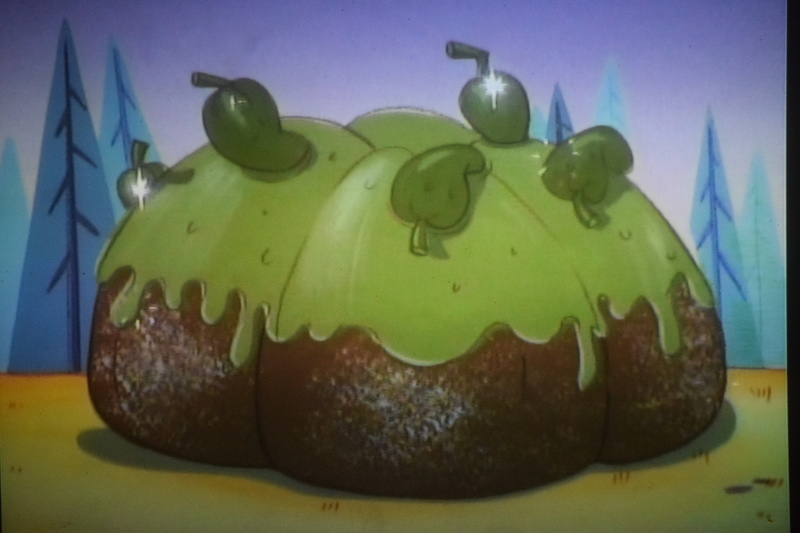 With all the junk those boys scarf down, this cake has got to be the granddaddy of it all if Dag says it’s his favorite. Cut jalapeños, clean out seeds and ribs, and finely chop. Melt 1 tablespoon butter in a medium saucepan on medium heat. Cook down jalapenos until soft, about 10 minutes. Set aside. In a large mixing bowl, combine cake flour, salt, baking powder, and baking soda. In a stand mixer, beat butter and cream cheese together. Add sugar and beat until light and fluffy. Add eggs, one at a time, beating well after each. Add vanilla. Add dry ingredients in three additions, scraping down the sides of the bowl after each. Mix until just combined. Pour batter into greased Bundt cake pan. Smooth out and gently tap pan on counter to remove any air pockets. Bake for 60-75 minutes or until golden and a toothpick inserted comes out clean. Cool in pan for 15 minutes. Remove cake and let cool completely. Melt butter in a saucepan or microwave. Add powdered sugar a little at a time. Mix in milk and vanilla. Add a little green food coloring. Adjust thickness to your liking. If it’s too thick, add more milk. If it turns out too thin, add more powdered sugar. Pour glaze over cooled cake. Place jalapeños on top to make it look pretty. Cut, serve, and enjoy! I guess there’s another thing I have in common with Dag. I love this cake! It would completely break my heart (and my teeth) if I tried to eat a giant jalapeño Bundt cake only to find out it’s made of cement. Well, I can’t say the same for my beaver brethren (Norb splattered batter on Dag’s booty in Mistaken Identity), but this cake will at least keep the two of us out of trouble. For now.